Many Nintendo fans will tell you that Splatoon simply didn't reach enough players, but with Splatoon 2 the series gets a second lease on life, riding the success of Nintendo's Switch right into the living rooms of fans new and old. 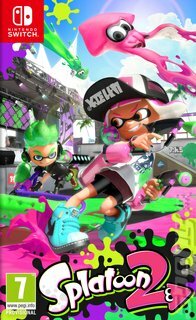 For those who missed it the first time round, Splatoon is a very Nintendo take on a genre it has largely neglected - the shoot-'em-up. Or, to be more specific, the multiplayer shooter. The concept is unmistakeably from the house of Mario, though - instead of engaging in grim and gritty military warfare, players step into an arena where their job is to use their weapon to cover this cartoony world in ink. Favourites such as Turf War - in which players simply compete to cover a map in as much of their side's ink as possible - return, but they're joined by a bevvy of new features. On the weapons front, for example, dual wielding Splat Dualities enter the fray, complete with a new roll move for dodging. And all the weapons are amped up by brand new specials, too! Then there's the new Salmon Run mode, in which you work with up to three other players to take down waves of Salmonid and pick up the eggs they leave behind. It's not only about online multiplayer and single-player now, either. For the first time players can compete in local multiplayer Turf War battles with multiple consoles. Up to 10 docked consoles can connect via LAN. Plus, the motion control functionality of the Switch's Joy-Con controllers allows for more accurate aiming than ever. Expect smart device support for enhanced matchmaking and voice chat as well as plenty of new content post-launch. All in all, there are going to be plenty of reasons to keep coming back to Splatoon 2.